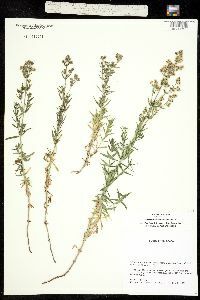 Plant: perennial herb; 3-6 dm high, nearly glabrous, erect Leaves: 4 per node, 13-31 mm long, linear to broadly lanceolate, 3-veined, minutely scaberulous, the apices mostly obtuse INFLORESCENCE: flowers perfect, numerous in a more or less condensed terminal, nearly leafless panicle of cymules Flowers: corollas rotate or a little cupped at base, the 4 lobes ovate, the apices blunt; ovaries generally densely hairy with short upwardly-curved hairs Fruit: FRUITS dry, with short bristles, the mericarps becoming reniform Misc: Meadows, streamsides, moist shady places; 2150-2900 m (7000-9500 ft); Jun-Aug REFERENCES: Dempster, Lauramay T. 1995. Rubiaceae. J. Ariz. - Nev. Sci. 29(l): 29. 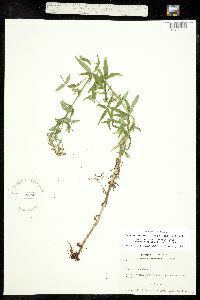 Perennial herb with a creeping rhizome 20 cm - 0.8 m tall Leaves: in whorls of four, stalkless, 1.5 - 4.5 cm long, to about 5 mm wide, linear lance-shaped with a minutely rounded tip, three-veined, hairy-fringed (ciliate), sparsely hairy on the lower surface. 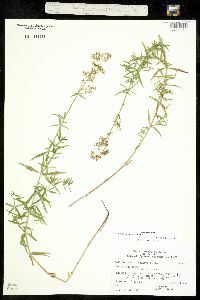 Inflorescence: a terminal, branched, showy cluster (cymose panicle) of numerous flowers, about 10 cm long and wide. Flowers: white to creamy, 3.5 - 7 mm wide, more or less flat and circular in outline, with four short lobes. Lobes about 1 mm long and wide, pointed. Stamens four, alternating with lobes, shorter than corolla. Styles two, short. Fruit: dry, indehiscent, 2 mm wide, spherical, paired, separating when ripe, sometimes shortly hairy, one-seeded. 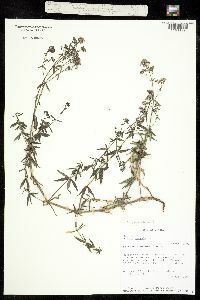 Stems: numerous from base, ascending to upright, slender, four-angled, branched, short-bearded just beneath the nodes, sometimes minutely rough-hairy. 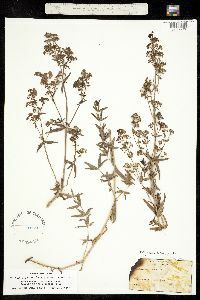 Habitat and ecology: Found in a variety of habitats, including prairies, moist meadows, and fields. 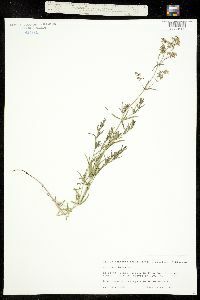 Etymology: Galium comes from the Greek word gala, meaning milk, referring to the plants that are used to curdle milk. Boreale means "from the North." [Deam recognizes three varieties based upon differences in fruit indument.] [Fruits of var. boreale have long straight hairs. This form is] restricted to the lake area. 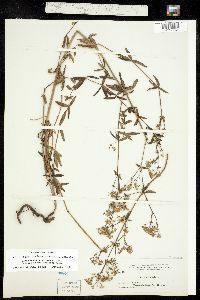 Our specimens are from moist, sandy soil along railroads and roadsides and one is from a tamarack bog. 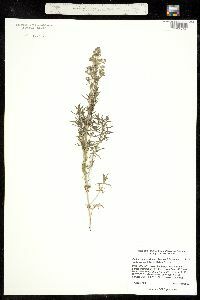 [Variety hyssopifolium has glabrous fruit. 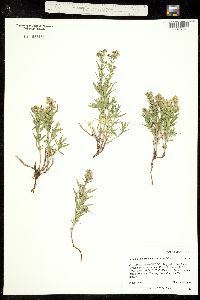 It is] restricted to the lake area and found in dry, sandy soil along railroads and roadsides, and less frequently in bogs and marshes. [Variety intermedium has short appressed or incurved hairs. 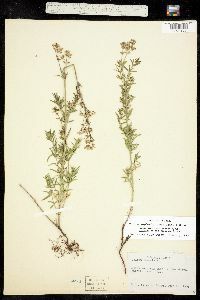 This form is] local in the lake area in moist, sandy soil in black oak woods, on borders of lakes, and along roadsides. 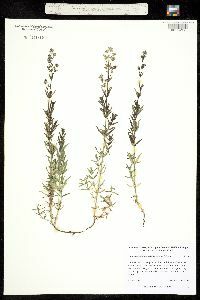 Erect perennial 2-8 dm, the numerous stems commonly short- bearded just beneath the nodes, otherwise glabrous or scaberulous; lvs in 4's, glabrous or scabrous, lance- linear, 1.5-4.5 cm, 3-nerved, the tip minutely rounded, not mucronate; sterile axillary branches with smaller lvs often developed; fls numerous in terminal, rather showy cymose panicles, with white or slightly creamy cor 3.5-7 mm wide; fr 2 mm, glabrous or with short, straight or curled (not hooked) hairs; 2n=44, 66. In a wide variety of not too dry habitats; circumboreal, s. in Amer. to Del., Ky., Mo. and Calif. June, July.